Model 341AS air pilot actuator threads directly onto the collars of push-button valves. 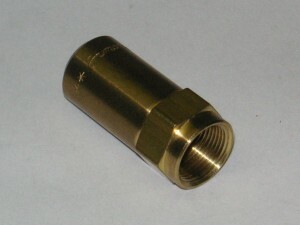 It is used primarily for time-delay circuits and other slow-building pilot pressure applications. The actuation of the operator is delayed until the pilot pressue reaches 35 psig +/- 5 psig. At this pressue, the operator piston snaps forward to actuate the valve and remains shifted until the pilot pressue is exhausted.